This site has been somewhat superseded by another site containing far more information on the matter, together with documentation. The author (or authors) of such site is unknown, however, contains a vast amount of supporting documents, including court files. That site can be visited at www.terencegoldberg.com. We can verify that the information contained on that site is accurate. 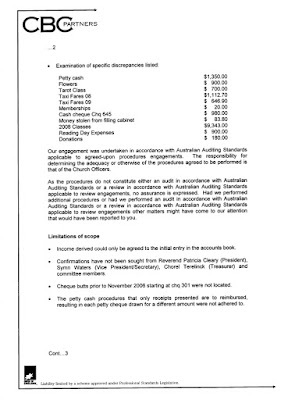 This page was created to detail the missing moneys at Enmore Spiritualist Church; the ensuing battle between those behind those missing moneys and their fight with those who were simply searching for answers; the ensuing court case; and the illegal sale of our church building at the hands of Terry Goldberg of Turner Freeman Lawyers. If you think there's nothing happening, then think again. There's plenty happening in the background and those responsible for the illegal sale of our church will have to face the music. Remember, you can choose your actions, but you may have no control over the consequences of those actions. The wheels of justice and law move slowly, but as in the old adage, the mills of the gods grind slowly, but finely. Today, let's talk about Contempt of Court and the particulars thereof. Wilful (rather than casual, accidental or unintentional) breach of an order or undertaking by which a person is bound and of which the person has notice, will amount to contempt: Australasian Meat Industry Employees Union v Mudginberri Station Pty Ltd, above. It is not necessary to prove a specific intention to disobey the court’s order: Anderson v Hassett  NSWSC 1310. As to the requirement for notice of orders, see Amalgamated Televisions Services Pty Ltd v Marsden (2001) 122 A Crim R 166. A court may generally accept an undertaking from a party in substitution for making an order, subject to the same jurisdictional limitations: Thomson Australian Holdings Pty Ltd v Trade Practices Commission (1981) 148 CLR 150 at 165. For the purposes of the law of contempt an undertaking given to the court is treated as if it was an order. "In Australia a judge may impose a fine or jail. The latter is usually until such time as a person has performed a sincere act of contrition (i.e., purging the offense) or the order is no longer deemed necessary to the carriage of justice." Refer specifically to Section 25. The truth is never defamatory. Let's talk about the Supreme Court and let us talk specifically about the application for the assessment of costs filed with the Supreme Court of NSW in June 2010 by Terry Goldberg of Turner Freeman Lawyers. Now, this document is extraordinarily interesting as there are a number of inconsistencies held within. Let's talk about those inconsistencies, but before we do, let us firstly say that no accusations are being made here. The facts of the situation are simply being laid out. We also need to state here that this site contains only facts and as far as we are aware, there is nothing false or untruthful in its content. Back to the above document, i.e, the Application for Assessment of Costs filed with the Supreme Court of NSW by Terry Goldberg of Turner Freeman Lawyers. "In this matter, we acted for Enmore Spiritualist Church Incorporated ("the Church")." This is difficult to understand as the church was named as a defendant in case 5454/2009. The church would have had to have been a plaintiff if Turner Freeman Lawyers was acting for the church. As the church itself was named as the other side, then quite obviously Turner Freeman Lawyers could not have been acting for the church. "On 12/06/09 a committee meeting was held and a resolution passed removing [redacted] as committee members and as members of the Church. On 10/09/09 the removed members and other persons attended at the Church premises and attempted to break into the Church and to take possession of the premises. They also threatened the members and the police had to be called to assist." There is obviously something wrong with Turner Freeman's memory as they wrote to the Defendants in case 5454/2009 on 24 September 2009 and stated: "That being the case, our clients accept that the resolutions purportedly removing you and the other persons from the Committee on 12 June 2009 were not valid." 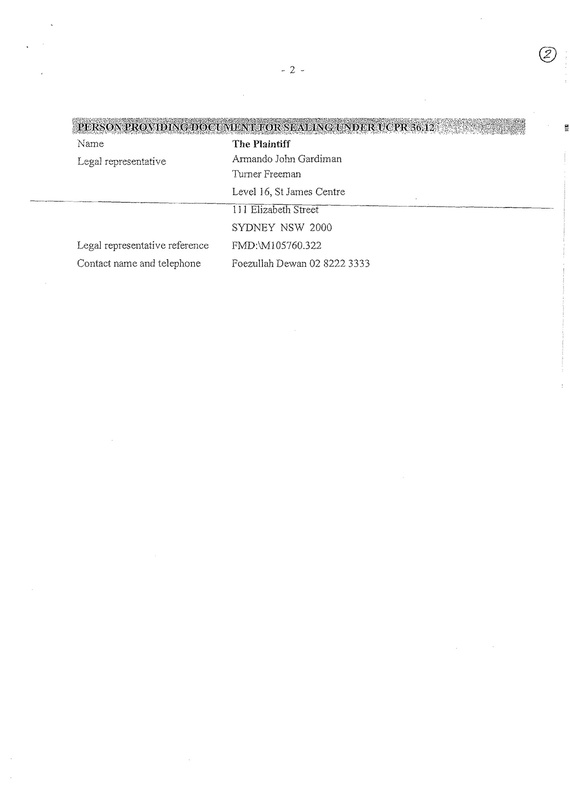 It also needs to be pointed out that the police were not called on the date Turner Freeman specifies and if they are inferring that their clients were threatened, then they has been misinformed as their clients were not present on the evening of 10 September 2009 as they declined to attend the meeting. However, Jon Lindsay was hiding in the church premises itself and did not present himself to the members and was therefore not threatened either. Nobody attempted to break in to the church and it was a quiet gathering of the members of the church in order to hold a meeting. 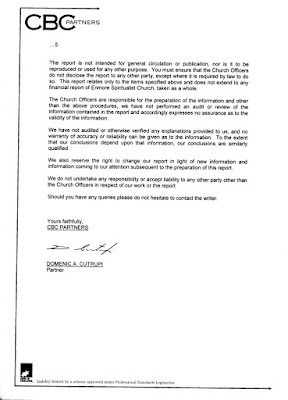 "On 14/09/09 a committee meeting was held at our offices and a resolution passed providing instructions to act for the Church..."
The above statement is not possible as the quorum for committee meetings of the church was five in number and any meeting that took place did not achieve that quorum and therefore any decisions made in any meeting without that quorum have no bearing. each party to bear its own costs. Again, Turner Freeman Lawyers appears to have a faulty memory as there were only two orders made by the Supreme Court in case 5454/2009 on 27 November 2009 and they were that 1. By consent, each party is to pay its own costs; and 2. The matter is finalised. I find it difficult to understand where Turner Freeman Lawyers found their orders from. Perhaps they are talking about a separate court case held on the same day. The above statement is also very hard to understand as the membership list provided to the Supreme Court in case 5454/2009 bears no resemblance to the true membership list at that time. The above statement shows that both Turner Freeman Lawyers and Caroline Allen knew that a false membership list was passed to the court. Again, we find the above two statements extremely difficult to understand as the agreement reached at the Supreme Court was that the Defendants in the case could attend the forthcoming AGM. The above statements by Turner Freeman Lawyers and Foez Dewan now formerly of Turner Freeman Lawyers appear to clearly state that neither they nor their clients were going to adhere to the agreement noted by the court. The Plaintiffs in case 5454/2009, heard before her Honour Justice Bergin, Chief Judge in Equity in the Supreme Court of NSW, on 27 November 2009, sought a party/party costs order against the Defendants. This was denied and a solicitor/client Order was made in its place. The Order made is 'Each party is to pay their own costs'. As the party/party costs Order was denied and as the Order made in the Supreme Court is solicitor/client, then Turner Freeman Lawyers and their clients using church funds to pay legal costs are breaching that Order. It can not be made any clearer than that. Also, Item numbers 893 to 895 in the application for the assessment of costs relate directly to Court costs for Supreme Court case 5454/2009. The invoicing of these amounts directly breaches the Order made in this case. Item numbers 897 to 910, being disbursements, all relate to Supreme Court case 5454/2009 and the billing of such to the church breaches the Order made in this case. So, we can say that without a shadow of a doubt that false information has been passed to the Supreme Court of NSW in order to obtain a Certificate of Determination. It was with this Certificate of Determination that Turner Freeman Lawyers obtained a Judgment of Debt against Enmore Spiritualist Church and sold our church building. We, however, are open to the suggestion that Turner Freeman Lawyers passed this false information to the Supreme Court of NSW in error. Once again, nobody is accusing anybody of anything on this website, but is merely pointing out provable facts. All the necessary documentation has already been posted on this page. Also, Justice Bergin, Chief Judge in Equity has been written to and informed that the Order she made in case 5454/2009 has been breached. In relation to comments below that state that Foezullah Dewan is an employee of Turner Freeman Lawyers, this is no longer the case. Mr Dewan is no longer in the employ of the said firm. 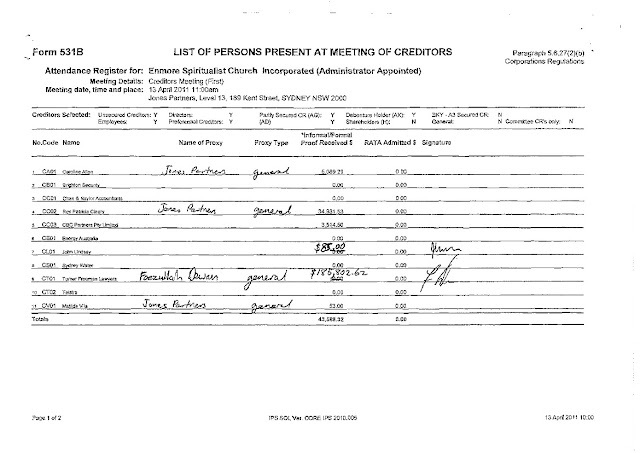 It has come to our attention that all four members of the illegal committee of the now defunct Enmore Spiritualist Church are all claiming to be creditors of the association. Patricia Cleary is claiming to be owed a staggering $34,931.53. Caroline Allen is in second place and is claiming to be owed $5,089.29. Jon Lindsay is claiming the paltry sum of $85.00 and Matilda Vila the sum of $53.00. Even though the last two sums are paltry, it clearly gives the illegal committee voting rights when attempting to wind up the association by claiming to be creditors. It would be more than interesting to discover what these amounts are for when it is obvious that the four abovenamed persons had no right or authority to spend money in the name of the church. What is even more interesting is that Turner Freeman Lawyers are claiming to be owed $185,802.62. The judgment of debt obtained in the District Court was for the amount of $124,661.90 and that figure has increased by $61,140.72. Today, the home of our church (and registered charity), 2 London Street, Enmore, was sold for $965,000. The church building was sold to pay a disputed debt to Turner Freeman Lawyers, so in effect, Turner Freeman Lawyers, after gaining access to the building's Title Deeds, sold our church. Turner Freeman Lawyers consistently refused to explain to the church members why they acquired the Title Deeds of 2 London Street, Enmore, despite repeated requests to do so. Turner Freeman Lawyers refused to respond to all requests for information from the members of the church. Turner Freeman Lawyers refused to listen to the church members, in that Caroline Allen, Jon Lindsay, Matilda Vila, Miranda McCarthy (aka Mandy Miami), and to a certain extent, Patricia Cleary, were not the legal committee of the church and were claiming to be such after illegally changing the locks, and therefore had no right to seek legal advice in the name of the church. Our beloved church is now gone to pay a disputed legal fee of $124,661.90 to Turner Freeman Lawyers. 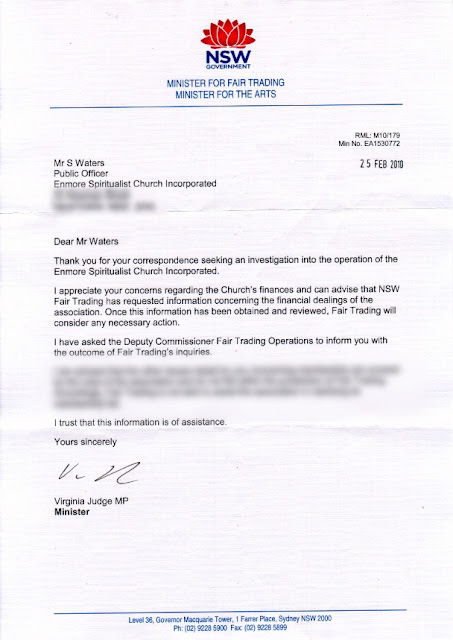 It is worth mentioning here that the conduct of Turner Freeman Lawyers, in relation to events at Enmore Spiritualist Church, is presently the subject of a formal investigation by the Law Society of NSW, after being referred to the Law Society by the Office of the Legal Services Commissioner, Mr Steve Mark. This investigation is yet to be finalised. What sort of legal firm sells a church out from under the members? How did a legal firm allow disputed committee members to accrue an invoice of that size? The Sydney Morning Herald has been notified of this eventuality and a story is in preparation. 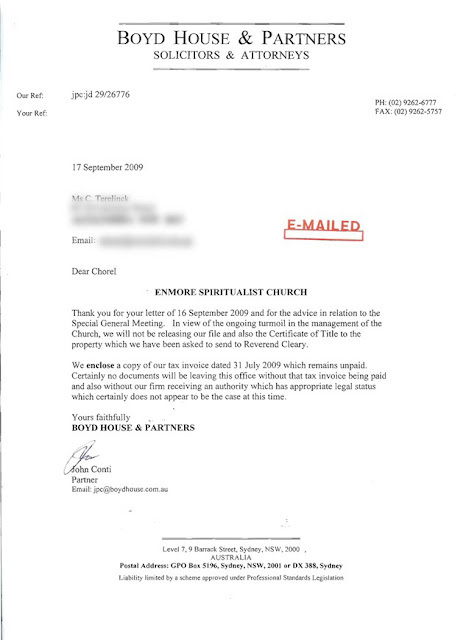 Turner Freeman sequestered the Church’s Title Deeds in the knowledge that their clients were not the legal committee of Enmore Spiritualist Church. Turner Freeman and their clients have refused to respond to all correspondence questioning their actions surrounding the Deeds. Turner Freeman claimed in writing that Orders of the Court existed where there were none. Foezullah Dewan of Turner Freeman threw a large ream of paper against many Church members at the Church premises on 4th February 2010, while also shouting at the said members. There are several witnesses to this event, including police officers who were present. Mr Dewan publically misquoted the Judgment/Order of Supreme Court case 5454/2009 by orally claiming the existence of Orders where there were none, on the evening of 4th February 2010 at the Church premises. Turner Freeman was well aware of obvious and documented fraudulent behaviour at the Church by Patricia Cleary, which was highlighted in the audit drafted by CBC Partners of June 2009, eg changed cheque stubs, forged taxi receipts, the dates being cut off receipts, etc. Turner Freeman was also aware that a number of their clients had attempted to break the law by trying to fraudulently change the Church signatories at the Commonwealth Bank Enmore, not once, but twice. As a result of these actions, the Commonwealth Bank froze the Church’s bank account. Mr Foezullah Dewan aided and supported his clients in illegally preventing the Church’s AGM from occurring when an agreement noted by the Supreme Court of NSW was in place. It was this behaviour by Turner Freeman that enabled Turner Freeman’s clients to claim that they were acting as the committee of the Church. As no AGM of the church’s financial members took place, the Church very obviously had no committee. 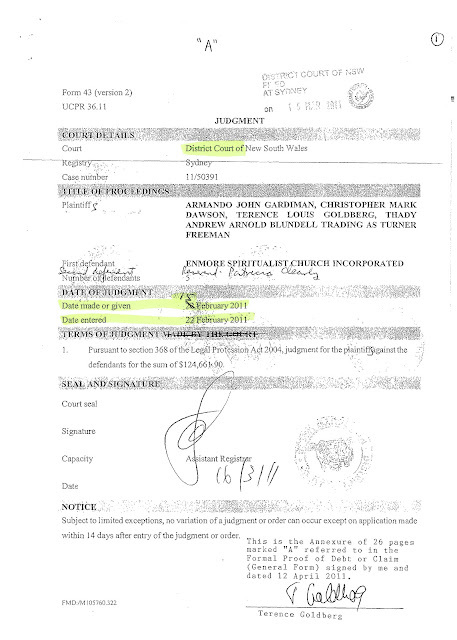 Turner Freeman disregarded blatant breaches by their clients of a signed legal agreement, drawn up at the Church on 14th May 2009 as part of a mediation settlement. Turner Freeman was very well aware that their clients had provided them with a false Church membership list. The Church membership list is easily verified as all Church members are named in that year’s Annual General Meeting minutes (2009). Turner Freeman has refused to respond to any correspondence or telephone calls regarding their conduct, or the conduct of their clients. This is contrary to a letter written to Pigott Stinson by Turner Freeman on 9th July 2010, stating that they would indeed respond personally to the people seeking answers. 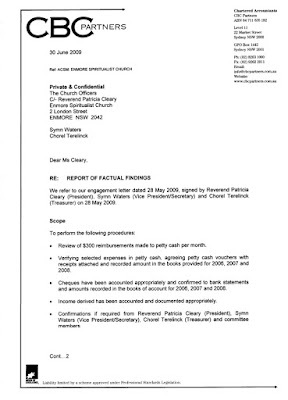 Turner Freeman reportedly drafted a highly defamatory letter for Patricia Cleary which clearly claimed that the defendants in proceedings 5454/2009 had been stealing from the Church without a shred of evidence to support this accusation. This letter was subsequently sent to a large number of Church members and urged members not to vote for the abovementioned people at the forthcoming AGM. Documents with the words Supreme Court written on them and also in the Court format were sent by Turner Freeman to sign when no Court proceedings were on foot. Turner Freeman sent a process server to a defendant's front door at 7.12am on Sunday, 27th September 2009, to deliver a copy of a letter that had already been received by the said defendant, and to which the defendant had already acknowledged receipt via E-mail. Turner Freeman was aware that this acknowledgement had been received as Turner Freeman replied to this message with a blank E-mail, intentionally or otherwise. It is our view that the sending of a process server was an obvious tactic designed to intimidate. Turner Freeman claimed in writing to be acting for Enmore Spiritualist Church when Boyd House and Partners was the firm of solicitors who took care of the Church’s legal matters. 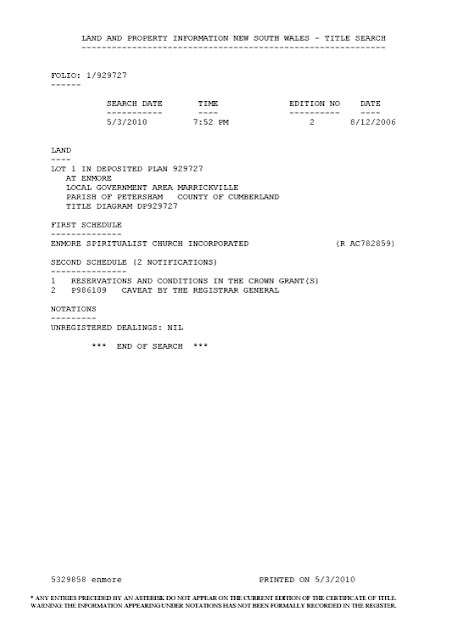 Turner Freeman disregarded Church committee meeting minutes of 3rd April 2009 that stated that Patricia Cleary could not use Church monies to fund any legal action. Turner Freeman also cancelled meetings with Inge Vann and Glen Shales, who at that time were purporting to be acting as Church committee members, when they requested meetings to discuss costs. Turner Freeman wrote to us and misquoted the Church constitution by stating that there was no quorum for Church committee meetings. The quorum for such meetings is five. Turner Freeman misquoted the Associations Incorporation Act in correspondence to us by stating quite clearly that there was no quorum for committee or general meetings. One would expect a large law firm to be either aware of the said Act, or to research such before the quoting thereof in legal correspondence. Turner Freeman, on an unknown date telephoned the solicitor who acted for the defendants in Supreme Court case 5454/2009 and said words to the to the effect of: How can I get one of the defendants from proceedings 5454/2009 off my case? This is inappropriate behaviour and is not of the professional standard we expect from a law firm such as Turner Freeman. Click on the picture pages below to see them in full size without the right hand side being cut off. 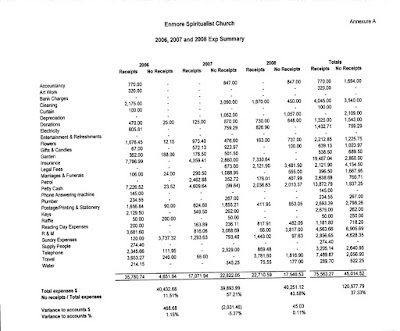 Below is a dated commentary surrounding the non-receipted expenditure of $45,014.52 at Enmore Spiritualist Church and the campaign mounted against innocent people who raised the issue of faulty accounting systems at the church. To this day, no one has given any explanation as to the whereabouts of the aforementioned non-receipted expenditure of $45,014.52. All those who have steadfastly raised questions have been the subject of an aggressive battle in order to silence them. Let's start with the article in the Psychic News. The comments in bold and italic are the sentences and paragraphs printed in the Pyshic News and the paragraphs underneath are the responses to those claims and assertions. Enmore church president vindicated in the Supreme Court. 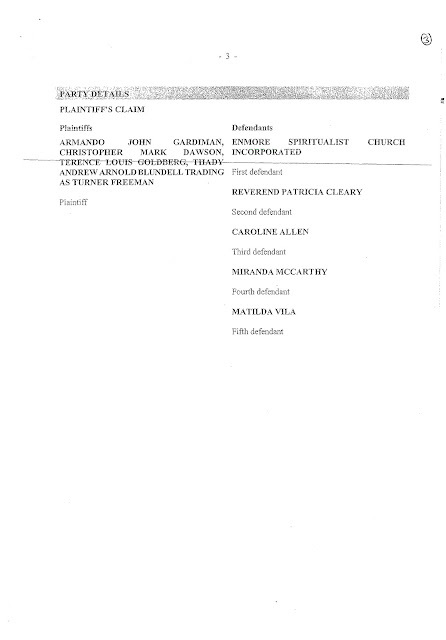 This is entirely false as Ms Patricia Cleary went to the Supreme Court to attempt to invalidate a special general meeting which was held at Enmore Spiritualist Church on the 10th September 2009, therefore no vindication of any kind took place. Ms Cleary was removed as president of the church at this meeting. According to a media release issued in the name of Committee of the Enmore Spiritualist Church, after an almost year-long campaign against the Rev Cleary, four of the six defendants in the case, have admitted making a series of false claims. Again, the above paragraph is false and misleading. On receipt of the finance books by the new treasurer it became evident that there were inconsistencies. This is not a false claim and definitive evidence exists to substantiate these assertions. The church itself was named as a defendant in the case, and there were five people who were defendants. It is a widely held belief that the church was named as a defendant in the case as if costs were awarded against the plaintiffs, the church would have had to be sold to fund the case. In this turn of events, it would appear that the plaintiffs were not acting in the best interests of the church itself. They alleged that there had been misappropriation of church funds and that the church was being investigated by the NSW Police and fraud squad, when in fact no such investigations had been considered. Again, this paragraph is entirely false. The four people mentioned above at no point made claims of misappropriation of funds. It was factually stated that there were inconsistencies in the financials and non-accounting of monies. A full audit of the books took place in June 2009 and that audit recorded non-receipted expenditure of $45,014.52 for the years of 2006, 2007 and 2008 during Ms Patricia Cleary’s incumbency as treasurer. I place below this blog the report of factual findings for reference. The NSW Police were indeed involved and remain involved in the situation. The NSW Police event number for this in case of any doubt is E373 059 63. It may be worth pointing out that when Ms Cleary was confronted in a committee meeting in March 2009 regarding money going missing from a locked filing cabinet within the church she responded with words to the effect; ‘Spirit took the money’. Two other committee members, being Caroline Allen and Miranda McCarthy (who operates under the pseudonym of Mandy Miami) who were also plaintiffs in the already mentioned court case also said words to the effect; ‘Yes, Spirit takes money’. Among the false claims given to the media was that the Rev Cleary had been ousted as treasurer by long-time church member Chorel Terelinck. Ms Terelinck was in fact a recent member, and the Rev Cleary had already expressed her wish to stand down as treasurer at the 2008 annual general meeting. Once again, this is a false statement. 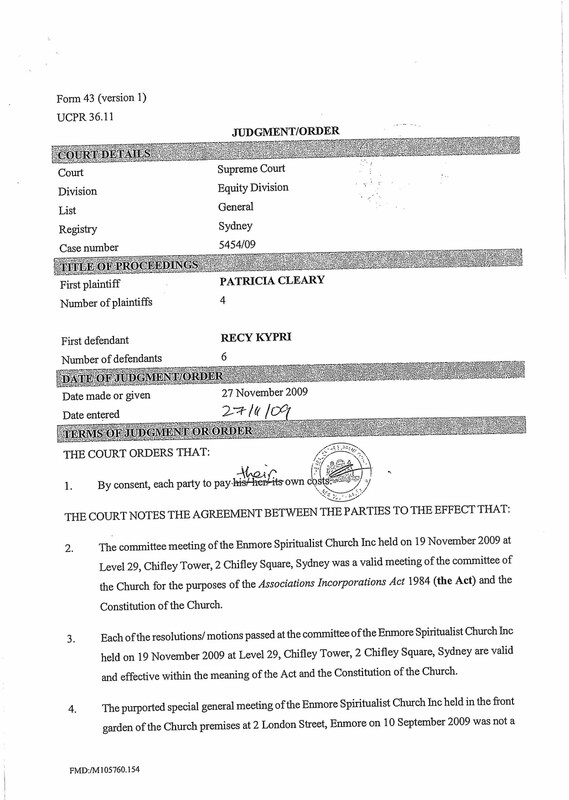 Ms Cleary was indeed ousted as treasurer of Enmore Spiritualist Church on the 5th February 2009. Ms Cleary did not receive any nominations for the position. On losing the position of treasurer, Ms Cleary told the committee the next day on the 6th February 2009 that she was going to seek legal advice in order to regain the position of treasurer once more via legal means. She was informed that this could not happen as it was by a majority decision by the church members that she lost the position of treasurer and it was reaffirmed to Ms Cleary that Ms Chorel Terelinck now held the role. Ms Cleary furthered this wish of regaining her position as treasurer by telephoning longstanding members of the church and accusing them of betraying her as they had not nominated her for the position at the annual general meeting. I wish to make it known and state that Ms Cleary did not express it as her wish to stand down as treasurer and if she did so then this expression was not made in the public domain. Also, Chorel Terelinck has been a member of Enmore Spiritualist Church for over 22 years. It is entirely false to publish the statement that Ms Terelinck is a recent member of the church. Chorel Terelinck has been a member, platform medium and teacher at the church for many years and has endeavoured and been committed to the upkeep of the good name of the church and has provided her services to the church on a completely voluntary basis and over the years has ensured the continuance of the church by bringing in a great deal of money in donations. There was also an accusation of “unreceipted expenditure of approximately $45,000 over three years” which has similarly been proved false. On reading the report of factual findings by CBC Partners in Sydney (which I'll post below this), you will no doubt be made aware that this ‘accusation’ is not indeed false. Ms Cleary has not to date, nor to anyone's knowledge, presented the receipts for the abovementioned sum either to the committee or to the Department of Fair Trading who is presently investigating the nonreceipted expenditure of $45,014.52. 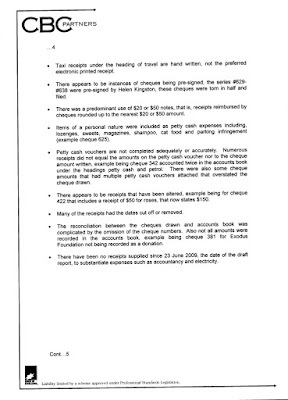 Ms Cleary consistently refuses to explain to the church committee, the church members and the Department of Fair Trading where this money was spent and on what items. When ordered to produce the relevant documents, it was discovered that the receipts had been removed by defendant and church member. The particular church member had never sighted any receipts for the years of 2006, 2007 and 2008 except for approximately three taxi receipts which were presented to him in early in 2009. In fact, he became a committee member in February of 2008 and had no access to any receipts of previous years and even for the year of 2008 itself. An affidavit and a statutory declaration have been provided to the Department of Fair Trading on this very subject. Jon Lindsay, if you're going to post such statements as this then please provide the evidence to all and sundry apart from your empty words. Little update placed here on the 23 March 2010: Had a little conversation on the phone last night and it seems that the receipts mentioned above have never been seen by anybody. No, no one at all. 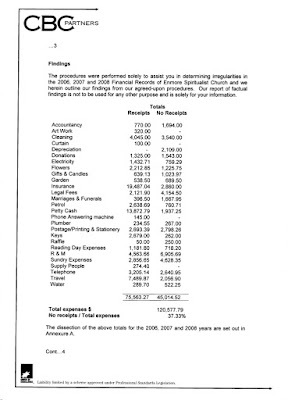 Apparently there is an email in existence from the accountants that says that they were never given any receipts at all when they were doing the church's financials at the end of every year. It's also interesting that the person who was the secretary at the church for the years mentioned above says that she never ever saw any receipts either. It's my betting that they never existed in the first place. Let's look at this rationally. No one has ever seen them. Mmmh, how strange! Following the Supreme Court decision, church money, account books and keys to the premises were ordered to be returned to the Rev Cleary’s solicitors within ten days, and five defendants were permanently restrained for entering the church premises and from calling or holding any special general meeting. The above statement is also partially false. The defendants in the case agreed to return all church property within ten days and this was duly carried out. The five defendants were not permanently restrained from entering the church premises. The Judgment/Order of case 5454/2009 in the Supreme Court of NSW is available on Jon Lindsay's blog for your information. You will note that the Court ‘notes an agreement between the parties’. This is not an Order and to publish that it is an Order is totally incorrect. The agreement between the parties was rendered null and void by Ms Cleary’s actions of preventing the defendants (and many other church members) from entering the church on the 4th February 2010 for the annual general meeting of 2010 in order for the members to decide on their membership. The point must be made and understood that the five defendants in the case instructed their solicitor to make a submitting appearance to the Court. This in no way ‘vindicates’ Ms Cleary. The defendants were advised that the case could last up to a week and they collectively did not wish to proceed in lengthy and substantively expensive court proceedings which could have proved harmful to Enmore Spiritualist Church. Due to Ms Cleary’s and other committee members’ actions, no annual general meeting took place on the 4th February 2010. A number of members convened, in accordance with the rules, one week later to hold the AGM and this was once again stymied by Ms Cleary and a handful of her followers who locked themselves into the church once more. There was no order for costs. The Court made only one Order on the day and this was in relation to costs. Both the plaintiffs and the defendants were ordered to pay their own costs. Again, the statement that there was no order for costs is entirely false. The Rev Patricia Cleary has been a member of the church for more than 50 years, and its president for 36 of those. Patricia Cleary first started attending Enmore Spiritualist Church at the age of 51 which is 36 years ago. She became the treasurer in 1979 and the president in 1984. Minutes of committee meetings will testify to this. This, of course, means that Patricia Cleary was the president for a total of 25 years. Patricia Cleary is no longer recognised by a great many as the president of the church as she was removed from that position in September of last year. The special general meeting during which she was removed was called and instigated by 21 members of the church due to the financial irregularities and inconsistencies. Also, feel free to leave a comment. Unlike Jon Lindsay's blog, no comments will be removed, but any questions will be answered, with proof where possible. Click on the graphic to see a larger and more legible view. Also, here's a letter written to the church's Public Officer from the Minister of Fair Trading. The church's Public Officer requested an investigation into the church finances after discovering the financial discrepancies and allegations of funds going missing. The church solicitor was approached by Patricia Cleary on a number of occasions, the most recent being approximately two weeks ago requesting access to the church's Title Deeds. Patricia Cleary has been written to on numerous occasions by the church's Public Officer requesting her reasons for wanting the Title Deeds of the church building and she continuously refuses to explain why she wants this document. It is only reasonable to assume these Deeds are required in order to procure money via a loan using the church building as collateral. Today feels very sad indeed. It seems that one person who is supposedly on the committee of Enmore Spiritualist Church has placed padlock upon padlock on its front door and no one can enter the church. The situation is just completely stupid and dare we use the word absurd or even mad. Now someone has taken to placing posters on the front window of the church which only lets everyone on the outside know that the situation is utterly crazy, and through all of this people will still not talk to each other. I know that an email was sent to certain other people and asked them to talk and received a terse and dare I say rude email in response. As someone said in the comments, what a load of horseshit! The church is closed, there is no money and a huge insurance bill is due in less than three weeks. Utterly absurd! What is to be gained through all of this? Heads need to be cracked together. On a separate note, one of the comments claim that this site is highly defamatory. The person who left those comments might need to be reminded what defamation actually is. There is no lie on this site and most of the claims are backed up with relevant documentation. This site came into place because it gave others a right to reply from awful things that were being said about them both orally and written. Everyone has the right to defend themselves. See below this for the dreadful article that appeared in the UK's Psychic News and you'll see what we're talking about. Whether you feel like it or not, just pick up the phone and make some phone calls. Talking to each other really is the key and solution to all of this stupid and terrible mess. Who knows, after a few telephone calls, this site might just vanish. Now, that's what all of us would like as we don't like this site being in existence either. The 'fight' at the church cannot be over a building. When Enmore Spiritualist Church became an incorporated association, the association became the owner of the premises. As a matter of course, the Director General placed a caveat on 2 London Street, therefore disabling any person from selling the property. It is impossible to sell. Carry out a title search and you will see that this is indeed the case. Even if someone did happen to illegally sell the building, the proceeds would be removed from that person or persons by the courts and then that person or person would receive hefty fines, if not a prison sentence. Nobody is attacking an 87 year old woman. What people do want to know is where the $45,000 was spent and on what items. Simple really! Anonymous and N continually peddle the lie regarding the court case and its subsequent orders. Let's be clear on this one. The Honorable Patricia Bergin, Chief Judge in Equity entered one Order and one Order only and that was each party pay their own costs. Thus, if the plaintiffs try and get the sixth defendant, ie the church, to pay their legal costs then they are breaking that Court Order. If they do so, then the proper measures will be taken. On that you can be very, very certain. Anonymous and N, you are right on one thing. The Courts do not like it when Orders are broken. With regarding to going to Court once more and trying to get the defendants to pay the costs of the previous case, well this can't and will not happen. Read the Judgment/Order very carefully and you will see that the matter was finalised on the 27 November 2009. Also, there was simply no Order permanently restraining anybody from entering the church. There was an agreement between the parties in place and this agreement was broken several times by the plaintiffs. All I can say is that truth is far stranger than fiction. Someone posted a link in the comments of this site and it makes very interesting reading indeed. Have a look at the comments section to see the page we're talking about. So, we were right in thinking that committee members had been locked out of the church again. It is exactly the same as last year. The church was locked last year on the 15 June. Almost a year to the day. Jon Lindsay writes on his blog that the church is closed for 'repairs'. Either the new forum is a tissue of lies (which I'm not inclined to believe is the case), or Mr Lindsay's blog is not entirely truthful. To the unelected committee members who have been locked out all we can say is 'we told you so'. I think it definitely validates what the four committee members said last year. Yes, the ones who were taken to a vexatious court case. To the people who are presently locked out: Why didn't you talk to the others who went through the same thing you're going through now? Now you might just get a hint of what they went through last year. Isn't it funny how the truth always seems to leak out somehow! We would like to draw people's attention to the following website, http://enmorespiritualist.freeforumpro.com/the-truth-about-the-troubles-at-enmore-f2/enmore-spiritualist-church-the-real-story-revealed-t3.htm. We have absolutely no idea who the author is but it seems that the truth snowball is growing pace and now just cannot be stopped. We want to say thank you to the eloquent and articulate writer for taking the time to also add the truth. We wonder though many truth blogs and forums will have to be created before all the members finally do something. We note that there have been a large number of comments purportedly quoting a court Judgment. 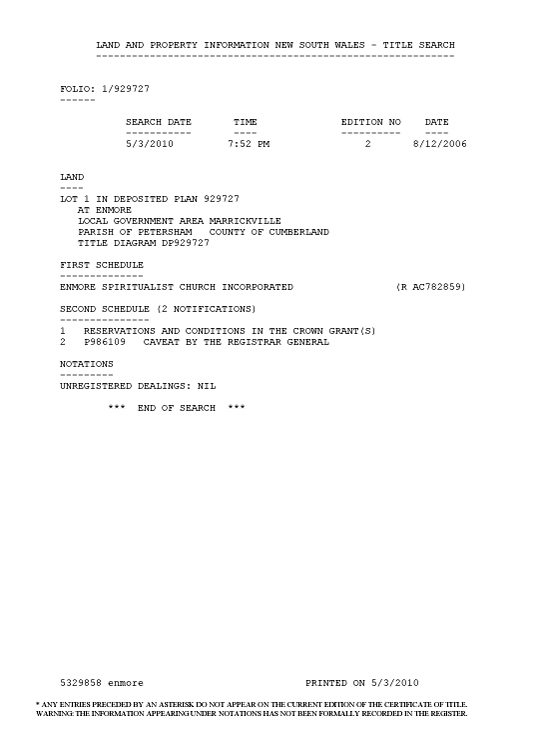 This following graphic which is the first page of the court document separates very clearly fact from fiction (click on the graphic to view it in full size). You will notice that there was only one order entered in that case last November and that is that each party pays its own costs. Therefore, no defendant in the case can be asked to pay the costs of the plaintiffs. The church was entered as a defendant in the case so it is quite obvious that the church cannot pay the plaintiffs' costs. The matter was also finalised on the day so that ruling cannot be appealed nor can it be overturned. Please note that the handwritten correction on the front sheet which was placed there by the court and this is why the Court Seal has been placed beside it. You will also notice that under the order there is an 'agreement between the parties'. 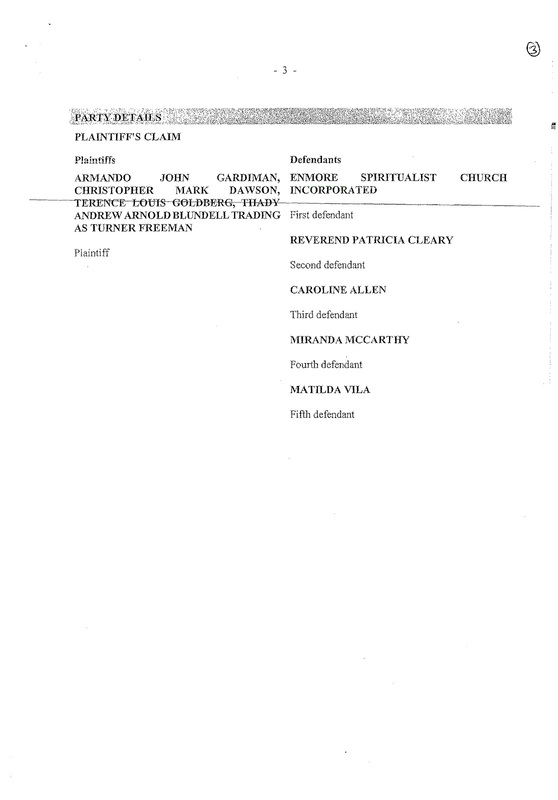 The plaintiffs, ie Cleary, Allen, Vila and McCarthy (aka Miami) broke the agreement by not allowing the defendants to attend the Annual General Meeting of Enmore Spiritualist Church on either the 4 February 2010 or the 11 February 2010 and as such there are very few judges, if any, who would take the side of the plaintiffs in any further ruling on the subject. What you will also need to bear in mind is that the 'agreement' was between the parties and does not, nor did not, affect any of the members. The fact remains that there was a decision by the members to remove Patricia Cleary as president (as well as the other so called committee members) and of course this still stands. Certain people can jump up and down all they like while supposedly quoting the 'Judgment/Order', but facts are facts and cannot be disputed or changed because some people don't like them. There we go, I'm glad we've cleared that one up! We weren't going to add any more to this blog but circumstances have forced our hand. You may have noticed that the church is now closed once more. Jon Lindsay, Miranda McCarthy (aka Mandy Miami), Caroline Allen and Matilda Vila have changed all the locks and are keeping absolutely everyone out of the church. They have placed a burglar alarm on the premises as well as video surveillance. Now we are as baffled at this madness as you are. Why is the church closed? Why are these four people determined to have the church closed and have absolutely no one going to the church? The church has no money and the bank has even seen fit to place a freeze on the account so that no money can be removed from the account and I guess that's another story entirely. The church is dying and the four mentioned above couldn't give a damn. Maybe it has something to do with the enormous legal bills that Pat Cleary, Miranda McCarthy (aka Mandy Miami), Caroline Allen and Matila Vila drew upon themselves when they went to court last year, supposedly in the name of the church, but the last laugh is on them really isn't it as the enormous legal bill is actually theirs and not the church's. There is even a court order in place preventing them from using church funds to pay their bill. Let's see them try and they'll end up in jail. Saw this quote and thought that it summed one or two of people who have locked up the church, absolutely and perfectly: "Never attribute to malice what can be adequately explained by stupidity." There has been no winner in all of this utter fiasco. The church has suffered the biggest loss of all at the hands of selfishness, stupidity, and some downright maliciousness and utter dishonesty at the hands of one particular person. I have been reliably informed that a large number of members of the church are preparing to proceed with a class action in the Supreme Court of NSW against Caroline Allen, Miranda McCarthy (Mandy Miami), Matilda Vila and Jon Lindsay in relation to their behaviour. Furthermore, damages will be sought due to the defamation to the name of the church itself. Also, when the church is reopened, a police investigation will be instigated to query missing funds from the church bank account. Several letters have been sent to the four mentioned above and all attempts at any mediation have been ignored and our hand has been forced to take this action. This is not what we wanted. And off to court we go. Shame. Isn't it a shame that some of the people involved in all of this just can't admit that they were led up the garden path and sold out by unscrupulous others. Isn't it a shame that all the members now have to take them back to court again and all we want is the doors of our church open again. Isn't it a shame that all of this happened in the first place and people couldn't just be reasonable. It was very clear and obvious that there was a problem with the finances and all the members wanted was for the finances to be sorted out. Why on earth did a very small amount of people do the wrong thing and support the wrongdoing? That we will never understand. They have now put their houses and assets at risk because of their actions and the money that they now owe to Turner Freeman. Why couldn't they just see common sense and why can't they see common sense now? We can see that some of those, two in particular, were misled and they followed on due to promises made, promises that would not be kept. Now it's back to court again where more costs will be accrued and we are guaranteed that the costs will have to be paid by the small few who have done the wrong thing. Shame. All that they had to do was talk to the members. Is it too late? Well that's up to them. The members would rather put the money they've put together back into the church rather than a court case. The courts are closed until the new year and that's when it will all start to happen. We have just discovered that the illegal and unelected committee has placed the church into voluntary administration. If anybody tries to profit from the sale of Enmore Spiritualist Church and if any legal fees are paid from the proceeds of the sale of Enmore Spiritualist Church, therefore breaking the Court Order of Supreme Court case 5454/2009, then the correct legal redress will be taken. Of that, all concerned can be very certain indeed.